It is an early personal computer made by the Terak Corporation of Scottsdale, Arizona. It was sold from about 1979 until 1985. One of the first models was the Terak 8510/a shown above. It was based on the popular PDP-11/03 processor, a 16-bit CPU. The Terak 8510 could have as much as 128K of RAM with the PDP-11/23 option. For storage, it has big eight-inch floppy drives that go klunk-klunk, in IBM 3740 format, holding roughly 256K, 512K or 1 meg each. Hard disks of five to forty megs were available. The Terak featured both RS-232 and 20 milliamp current loop serial connections, so you could connect to the printers and teletypes of the time. The keyboard included a numeric keypad and arrow keys arranged in a vertical column. The Terak was popular for teaching Pascal to college kids. As such, all the oldsters who were in college then and used this computer have a great affection for it, meaning they can no longer remember how slow they were. The Terak was advertised as a "Graphic Computer System." The monochrome display could show a mixture of text and graphics. The screen was divided into three sections (each 80 dots high) and each section could be independently set to either text, graphics, or both. Text was at 640 x 240 and memory-mapped graphics were at 320 x 240. While compiling your UCSD Pascal program, the Terak adjusted the video display so that as the compile and link progressed, you could watch the compiler's memory usage bit-for-bit, watching the stack move toward the heap. Text was memory-mapped within the PDP-11's IO space. Each line of 80 characters was represented by 80 bytes. There were 25 lines but only 24 could be shown. The display could be scrolled by setting the starting address in a memory-mapped register, so text could be scrolled smoothly by scan line as well as text line. Character fonts were user-defined. Each byte was mapped to its screen representation through a soft character generator. Its memory was mapped into the same space, hidden by a bit in the screen controller register. Users could design their own fonts. Games could use their own fonts. Text editors were developed for Russian and Hebrew. Teaching aids could show Japanese and Chinese. The system included a twelve-inch composite video monitor. It even had programmable sound and a two-inch speaker. The main system box was robust metal, weighing about forty pounds. Available operating systems included the UCSD P-System and DEC's RT-11. Languages included Pascal, FORTRAN IV, APL and BASIC. Someone even ported an early version of Unix to the Terak. In November 1981, an 8510/a with 56K of RAM and one floppy drive was $8,935, or the same buying power as $22,358 in 2010. An extra floppy drive was $2,570. You could even upgrade to color graphics at 640 x 480 by eight colors for $10,550. A ten meg hard drive was $7,985. In his "An Unofficial History of Graphical User Interfaces", Stanford University Professor Anthony E. Siegman mentions the Terak in his "Histories of Individual Graphic User Interface Elements," saying the UCSD P-System used one of the first keyboard-based menus (where you selected functions by pressing the key corresponding to the first letter of the function, such as "F" for Filer and "L" for "directory." :-) and under "Bitmapped displays", where Xerox PARC, PERQ and the Terak are mentioned as circa 1978 contenders. See http://www-ee.stanford.edu/~siegman/GUI_history.html (dead link, saved at Archive.org). 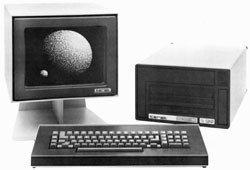 In her history of computer-aided design in the IEEE Annals of the History of Computing, Kristine Fallon states that the first personal computer CAD system was T-Square, developed by T&W Systems for the Terak, shipping in 1979. The University of Arizona purchased eight systems for this purpose. T&W ported T-Square to the Apple II, where it was known as CADApple. It was ported under UCSD P-System to the IBM PC in 1981, where it was known as VersaCAD. Eventually VersaCAD was ported to DOS. What does the Terak have to do with the Macintosh and MacPaint? The Macintosh's operating system was bootstrapped on an Apple Lisa computer. The Lisa's OS was written on the Lisa using a port of the UCSD Pascal compiler and P-System. The Lisa's port of the P-System was prepared on an Apple II, which had its own version of the P-System that was developed by Bill Atkinson, the Apple programmer who later wrote MacPaint. Atkinson ported the P-System to the Apple II while visiting UCSD, who helped Apple with the port using a Terak. Some people think he got the idea for MacPaint from the paint programs he saw in use on the graphics-intensive, square-pixel Terak. Thanks in part to Gary Capell (gary@cs.su.oz.au) for parts of this story. That's "integrated development environment," not the hard disk interface. A forerunner of the language-sensitive programmers's editor was the Cornell Program Synthesizer, originally developed on the Terak by Professor Tim Teitelbaum. While a student at the New Mexico State University, virtual reality promoter Jaron Lanier worked for an NSF-funded project that developed computer-assisted-learning courses in Pascal programming and trigonometry. He'd often spend his spare time hacking on a color Terak. Terak among the "Top 5 Futurist Computers"
At http://www.shmooze.net/~tiff/futurist.html (dead link), in ".tiff" magazine, the Terak is mentioned as one of the "Top 5 Futurist Machines Of All Time", among the Sinclair ZX-80, the Macintosh, the Nintendo GameBoy and the SGI Indy. The Terak lives on as an entry in 'termcap' files on Unix systems everywhere, because in its time its horsepower and serial port made it a good "smart terminal" that could access time-sharing computer systems of the time, uploading and downloading files to its local storage. It had its own custom terminal programs. The Terak port of Kermit, written mostly in UCSD Pascal, was influential in the development and dissemination of that popular terminal program and protocol, becoming the basis of several other Pascal-based Kermits. One of my functional Teraks was invited to take part in the 1970s History exhibit at SIGGRAPH 98 in Orlando, Florida, July 19-24 in 1998, celebrating the 25th anniversary of the ACM SIGGRAPH conference, the annual gathering of the computer graphics industry. Dennis Nichols of UW-Madison's computing center visited the Terak factory about 1980. He remembered it as a "one-story building in a not-too-high-rent industrial park with offices in the front and workspace in the back". I wrote tools to convert most Terak 8510 FOTO / PHOTO / IMAGE bitmap images to conventional formats. Terak images were generally direct dumps of the graphics memory. The largest are 320 x 240 pixels, monochrome. Few had any file format per se, although some had headers that included the image's dimensions, and most contained other trailing junk from memory that had been written to disk when saved. Terak bits were reversed, so the most significant bit on disk was drawn leftmost on the screen. The "moon" animation shown in the Terak literature above was created by Michael Smith with help from John Halleck at the University of Utah. They received their first Terak in the spring or summer of 1978. The base image is below. The WeaselGraphix animated GIF was created from twenty separate images created by Paul Haeberli. Terak UCSD Pascal hides its 64 x 64 pixel boot image at offset 0x0800 in the SYSTEM.CHARSET of the boot volume. I'll soon add animated boot logos. This may have been a hack developed by students at UW-Madison. I've found five- and eighteen-frame versions. I wrote tools to convert Terak-style UCSD CHARSET bitmap fonts to a format that could be processed by PSF Tools to convert them to Windows .FON font files. The process dumps the CHARSETs to PSF's .text format, then to .FNT, then to .FON. Download a Zip file containing twenty-six Terak fonts converted to Windows 8 by 10 bitmap fonts. Drop them into \WINDOWS\FONTS. You can use them in Notepad, where you select a font under Format / Font. All start with the same prefix, like "Terak-SYSTEM". All are size 8. What will be on this Web page the next time you visit? I'd like to make an emulator of the Terak, or at first, an implementation of the old UCSD P-System. I very much look forward to recreating the entire Terak experience, especially the speed and sound of the disk drives, and the sound of the fan and speaker. I think the Terak emulator could be accomplished with a robust P-System emulator combined with an emulation of the Terak-specific functions. For more P-System info, see the UCSD P-System Exhibit. Please, it's not that I think that the P-System was and is the best. This is a hobby, and I have a life and a career in contemporary computer software. I have other archaic computers in my collection, such as a Zilog Z-80 development system, several Commodore PETs, C-64s and Amigas, and a DEC 350. I used Teraks among other types of computers when I was in college, so I have fond memories of using them. John Wilson of DBit.com and the Ersatz-11 emulator was once interested in adding Terak hardware support to this PDP-11 emulator for DOS, Windows and Linux. Peter Miller has an interesting UCSD Pascal cross-compiler and tool environment. I have several Terak 8510/a and hundreds of floppies. I bought the first one in 1990 for about $25 at a University of Wisconsin--Madison Surplus equipment sale. At one time, the UW had about a dozen Teraks in the computer science and math departments, including about eight that were available to students in entry-level programming classes. I have old Terak sales literature, and several years of issues of TUGBOAT, the Terak user group newsletter. Many of these disks and all of the ephemera were donated by gracious former Terak users and owners. TUGBOAT had a collection of public domain software. Sadly, I only have a few of these disks. BitSavers has a collection of Terak documents. If you know of someone who still has a Terak hardware or software, please have them contact me. I will give their material a good home, and will gladly pay the shipping charges, which can be considerable given the weight of the Terak. See the UCSD P-System Exhibit, a companion page to this one. See my Disk Utilities Exhibit for my techniques and tools for converting UCSD P-System disk images to files on contemporary computers. I'd like to extend the tools to recover other file formats used for Terak image files, animated movies and character sets. There's a Terak system manual in the Computer Product Manuals Collection (dead link) at the Charles Babbage Institute's Center for History of Information Processing. There's another Terak in the Machine Room (dead link) in the UK. Mark Riordan has a Terak page. He's got Mini-Unix version 6 for the Terak. There's a lot of information about the UCSD P-System at the University of California at Irvine, among their archives of computer systems formerly in use there. They used Teraks, too. Here is Doug Gale's oral history of Terak computing at Cornell. He mentions a "How to fix a Terak" tape they made. I'd love to get a copy. Whatever happened to Terak Corporation? In November 1983, Terak Corporation went public on the NASDAQ at symbol "TCGS". In late 1985, it was purchased by CalComp, then a Sanders company, but now a part of Lockheed-Martin. Apparently the corporate assets were transferred to New Hampshire. More than twenty years have passed, so you might have heard a similar story of the ups and downs of other computer companies. The story of Terak Corporation involves engineers in mountain cabins, furiously composing circuit boards, defense contractors, Chinese computer enthusiasts attracted to the customizable graphics, venture capitalists, and a sad tale of crash-and-burn. I hope to compose the details into a readable story someday. If you're looking for info about Deep Space Nine, Cardassia, a Vulcan leader, the King of the Ewoks, Indonesian varieties of cement, sailboat parts, a variety of sandpiper, or a river in Russia, you've come to the wrong spot. Yes, Deep Space Nine was once ruled by Cardassians who called it Terak Nor. This page was awarded the "Geek Site Of The Day" Award on October 16, 1996 (dead link), putting us right down there in the depths of obscurity with the "Slide Rule Trading Post" and up in the heights of nerdliness with the "Encyclopedia Xenobiologica: A Guide to Babylon 5 Aliens." Two of the founders of Terak have visited this page. The first was Bill Mayberry, still living in Scottsdale. I hope to speak with him to learn more about the history of the company. Dennis Kodimer followed. The third founding member of Terak is Brian Benzar. Copyright 2012 John Foust, All Rights Reserved. THIS PAGE MAY NOT BE USED OR PUBLISHED IN ANY FORM (WRITTEN, CD-ROM, ETC.) WITHOUT EXPRESS WRITTEN (HARDCOPY) PERMISSION FROM JOHN FOUST.